It’s an exciting time to be a pediatric therapist or to enter this growing field. Demand is higher than ever for your skills. Your passion for children sets you apart and gives unprecedented choices. Trust PediaStaff to show you all of your choices and help you pick from a wide variety of direct hire and contract options for any stage of your career. 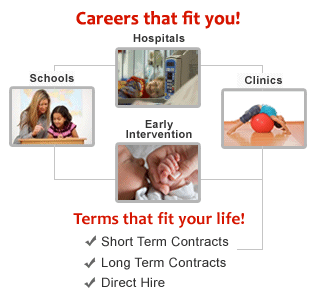 Browse our website to see all our jobs in pediatric and school-based therapy disciplines. Not in the market for a new job today? That’s ok. Enjoy our free resources compiled just for therapists and sign up for our newsletter; you can even follow us on your favorite social networking site! It’s All About The Choices!